Another photographer asked me two questions in response to another entry. If you had to choose just one of your cameras, the M9, m4/3 and DSLR, which one would you pick? Is it worth selling off the rest of my gear for the M9? I was all set to write a response when I realised that I didn't have a clue how to answer. The questions were, correctly, prefaced with the notion that these would be difficult to answer. However since one of the purposes of this blog is to pass on experiences gained by someone in the fortunate position of being able to use a lot of different kit, I thought that I should attempt to answer. Those that read my post on the Canon 5D MkII http://soundimageplus.blogspot.com/2009/12/why-can-i-love-canon-5d-mk-ii.html will realise that my "sensible" answer to this question would be the DSLR and the Canon in particular. Its the most versatile camera I've ever used and in terms of performance to price value, just about the best digital camera ever made. There's virtually nothing that this can't handle. Its the camera that I use for events, weddings, commercial work & commissions. In a rare burst of objectivity, it has my unreserved recommendation. Those who read the above post will know that I don't like using it, so this is an unbiased endorsement. It works quickly and efficiently, has pixels to spare, HD video to broadcast standard and its performance at high ISO's is incredible. However the above post will explain why it wouldn't be the one I grabbed in the fire. So why is this? Why would I not choose the camera that gives me everything I need? The reason is the difference between need & want. We all need to eat but want to eat food we like. Musicians are obsessive about their instruments. Any one who tells you their instrument is irrelevant is either lying or doesn't deserve to be called a musician. Try telling the virtuoso violinist that they can't have their Stradivarius & see what reaction you get. As a musician you pick the instrument you are comfortable with, what you can perform the best with and most importantly of all, you pick the instrument that inspires and excites you. Coming from that background I see no difference between my musical instruments and my cameras. If I just chose a camera that got the job done, then thats what I would be doing, a job. To me photography is much more than that. The famous quote from the football fanatic and former Liverpool manager Bill Shankly sums it up nicely - "Football's not a matter of life or death. It's much more important than that." Substitute photography for football and you have some idea of what it means to me. I terms of musical instruments I found my solution years ago. Frustrated with everything I tried, I ended up making (or rather assembling) my own guitar and I have been playing that for the last 28 years. The same solution is not possible in terms of cameras. I probably hold some sort of record for buying and selling digital cameras. I have genuinely lost track of what I have owned. Its been an endless fruitless quest for my "holy grail" A small, light, high quality camera that gives me the digital equivalent of Fuji Velvia film. 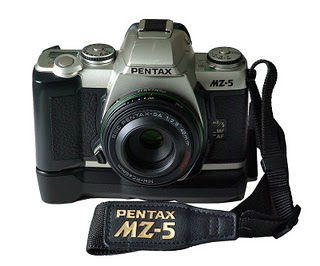 I found my solution in film days with Pentax. 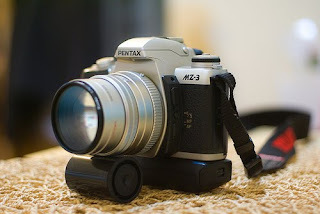 The beautiful MZ series for 35mm and a Pentax 645 for Medium Format. Until now - when I'm spoiled for choice. Finally there are cameras available that deliver all my wish list items. Small, light, high quality, stylish, well-designed cameras. The answers to my prayers have come from two unlikely sources. 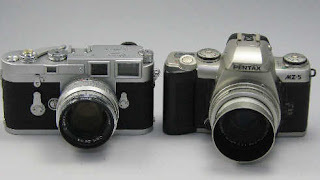 One from the long-established Leica company and one from the Japanese electronics giant, Panasonic. The fact that these two companies have been working together in recent years is not a coincidence. I love micro four thirds. Until recently, before economics & the arrival of the M9 indicated selling was necessary, I had all four cameras G1/GH1/GF1 & E-P1 and all the available lenses. This has been pared down a little now. I love the weight and size, yet the cameras are not TOO light or small. They still feel substantial, solid and comfortable in the hand. The images are sharp, with excellent colour. And at last a company feels confident enough to wind back the Anti-Aliasing filter to let us see what our lenses are capable of. I wish they would go the whole way and remove them altogether, but thats my personal thing and I can't see it happening. These are cameras that inspire and excite me. I want to use them, I want to take pictures with them. As photographers, we should, I suppose be only concerned with the final result, The camera is only a tool, a way of creating the image. NONSENSE! We wouldn't be photographers if we didn't enjoy the process. The "hunt" for the image, the set-up, the composition, the handling of the camera, the adjustments. Sometimes pressing the shutter can be an anti-climax, but then you always have the excitement knowing that you can do it again. With my m4/3 system I get all of this, plus knowing that I will get quality results and am putting off the day that my body finally cries ENOUGH! Someone once asked me why I like using Leica's when they are so fiddly and slow to use. The answer probably sounds arrogant & patronising, but its not meant to be. I like using them because you have to know what you are doing to get good results. I like prime lenses and the challenge of finding the right composition by using my experience (and my legs!) I like using aperture and shutter speed to achieve the result I want. I like not being able to see the image previewed & then waiting for it to appear on the screen to see if I got it right. I enjoy the process, I enjoy the challenge. I'm not anti auto-focus and zooms, but stepping back a little has re-kindled some of the joy I had when I first became obsessed with the still image. And yes, if you are considering a Leica, you should know that you will miss shots. You won't have the right lens on the camera, you won't be able to manually focus quickly enough. These things will happen. But you will also find that you look at things in a different way, you will find solutions to problems that you didn't have before and those solutions may lead you in directions you haven't explored. There's enough on this blog about the Leica's incredible image quality, what its good at and what its not, so I won't go through those again. So if I had to pick one camera, would this be it?. Well the answer is probably yes. I've written before that this camera ticks more boxes for me than any other. My main source of income is stock photography. That photography is mainly landscape, travel and location work. For this the Leica is perfect, in terms of Image quality, and handling. Since this is the work I most enjoy I would now be dissatisfied by the results from any other camera. However its a close call. The GF1 with its 20mm lens is a very close second. A question I really can't, and would be reluctant to answer anyway. You would have to be very sure that this was the camera for you. You would have to be aware that you were ruling out a lot of photographic possibilities and that you could cope with the constraints that it would put on you. The much reviled Ken Rockwell, http://www.kenrockwell.com/leica/index.htm who I actually think is great fun, has become a seriously over the top advocate for the M9. But he talks about the great difficulty of photographing his children with the M9 because of the speed with which they move. You have to realise that the only way you are going to get decent pictures in low light is with a tripod, a flashgun or some seriously expensive fast lenses. You will get into lots of situations when you wish you had brought another camera with you. As stated before you have to accept that you will miss shots. You will have to more or less rule out sports or action photography or be prepared for a very low success rate. You will have to suffer the indignity of the majority of people thinking you got this old thing out of the attic when you know how much it costs, and feel compelled to tell them! You will have to be prepared to "bottle out" of certain picture taking situations which put your precious "investment" at risk. You will have to be prepared to shrug off, the "Male jewelry" "More money than sense" "How much - for that!" "He/She just bought it for show" comments. You may have to endure the envy, followed by hatred from other photographers, who would love to own one but since they don't will turn on you like a hungry wolf! You will have to endure the smug cosy world of certain ( Not everybody) Leica owners who will "welcome you to the club" with a knowing, "We can afford one and the other peasants can't"
All of the above were reasons I resisted buying one for so long. The latter ones, while obviously tongue-in-cheek do exist. Every Leica owner I came across seemed to be a complete rear end orifice and this really did put me off for years. That has now changed I'm glad to say. Many are friendly helpful and genuinely talented photographers. All of this faded away when I picked one up for the first time. I felt inspired and excited. I have been ever since. The M9 solves many of the problems the M8 created. The bottom line for me is that the images I see on the screen, taken with this camera are truly jaw-dropping. Its not a myth or an exaggeration, if you have eyes you will see it. If thats what you want & you can cope with the other stuff then its worth considering. But somehow somewhere get your hands on one. If its not love at first grip then its probably not for you. If it is be prepared for the consequences.